If you have been following the blog, you know how I love my Dals/Lentils. Thankfully, Sid has also inherited my my loved for Beans, Legumes and Lentils. Dals/Lentils along with store bought tortilla and a simple salad of cucumbers and carrots have been my lifesaver many a weeknight, when I have been too busy or too tired to cook a full course dinner. Panchmel Dal is a hearty lentil stew made of Five (Panch means FIVE in Hindi) different variety of Split and Skinned Lentils. Each lentil has its own unique taste and texture and nutritional profile. When all five of them comes together, it results in one hearty and wholesome stew, which is chock-full of nutrients. 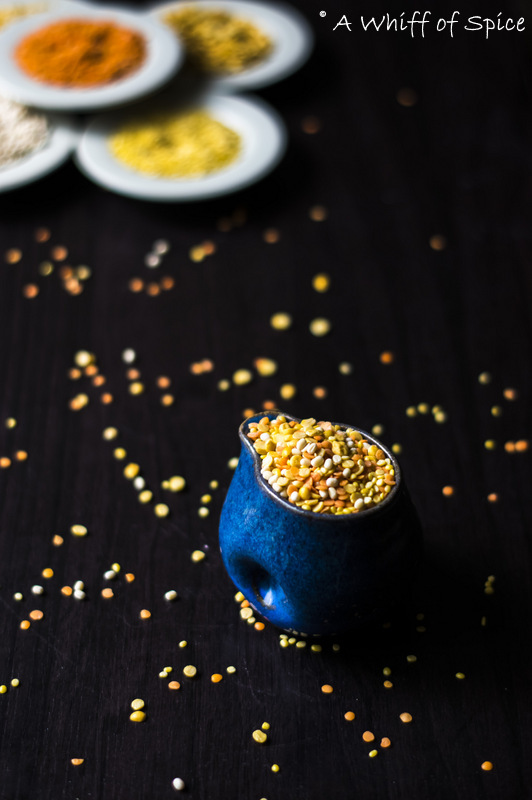 Growing up, Dals/Lentils was a staple in our home. We would have it everyday. Either, for lunch or dinner. Often for both. 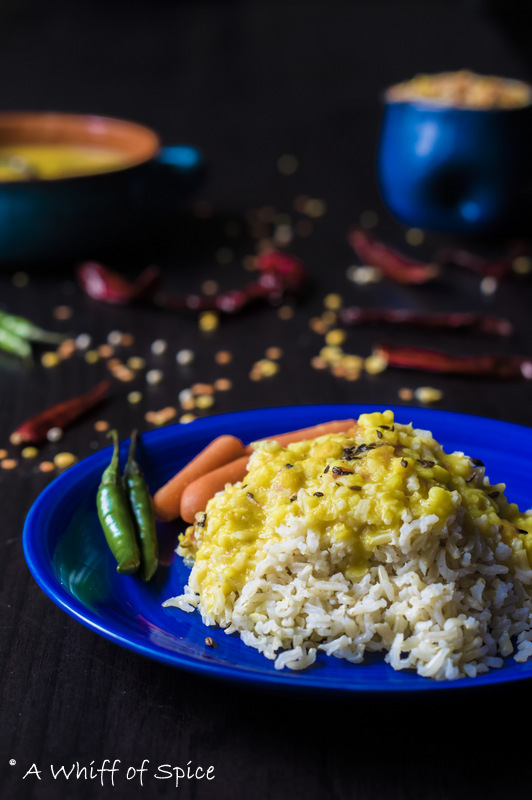 Masoor Dal (Split and Skinned Red Lentils) was the most commonly made Dals/Lentils, closely followed by Moong Dal (Split and Skinned Green Gram) and Toor or Arhar Dal (Split and Skinned Pigeon Peas). 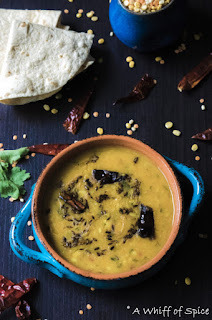 Urad Dal (Split and Skinned Black Gram) and Chana Dal (Split and Skinned Bengal Gram) though very well loved would be cooked not more than once a week, since they were on the heavier side and not as easily digested as the other ones. 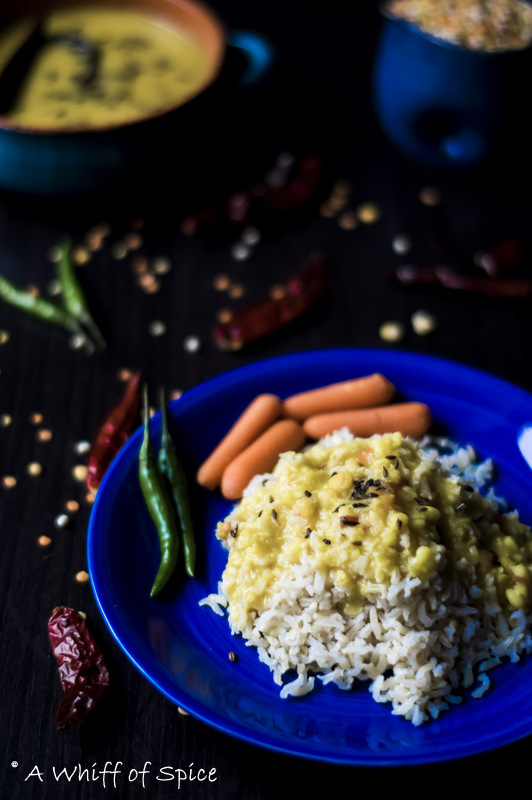 By the end of the month, often there would be a situation, where no single variety of dal would be sufficient enough to feed our 6 member family. Mom would then mix different variety of Dals/Lentils and play around with the tempering and come up with new variation every month. I loved those Mixed Dal/Lentil days. The taste and the texture would be so different from what we were used to. It was much later that I found out that Mom's Mixed Dal had a legitimate name. It is called Panchmel Dal, which literally means "medley of FiVE different lentils" and is native of Rajasthan. But I'm sure every state in India has their own version of this Dal. The authentic Rajasthani Panchmel Dal is rich. It is thick, and heavily spiced with cardamom, cinnamon, cumin and coriander and mainly cooked in Ghee. Lots and lots of Ghee. My version of the dal is thick, cozy and comforting too. But instead of going the Garam Masala (cardamon, cinnamon, cloves) route, I rely heavily on another amazing aromatic called Hing (Asafoetida) to perfume this dal. 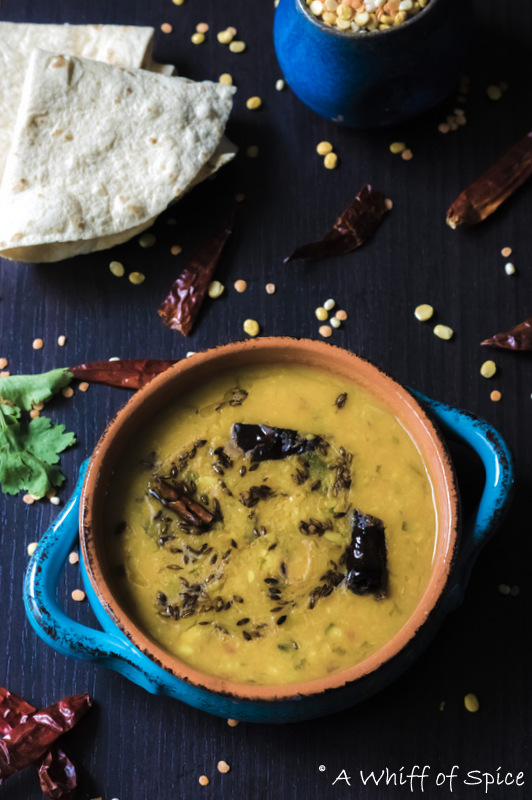 When combined with cumin seeds, red chilies, ginger and a mellowed garlic flavor, it creates a unique aroma, which beautifully compliments the complex texture of this particular dal. Here in Cincinnati, we do not have Dals/Lentils every day. Maybe once or twice a week. To be honest, for Sid and Sam, nothing comes close to their love for Dal Makhni. Given a choice, they would like to have it every day. But this Panchmel Dal is well received too. My little soup-o-holic treats it more like a soup than a Dal and loves dunking his crusty bread slices in it. Sour dough breads are his favorite. And now here comes the recipe! 1. Combine all the Dals/Lentils in a big bowl. Wash it thoroughly till the water runs clean. Soak it in warm water for 30 to 45 minutes. Drain and rinse it before cooking. 2. In a pressure cooker combine the washed lentils, water, turmeric powder and garlic. Alternatively, you can cook the lentils on stove top too. Combine the washed lentils, water, turmeric powder and garlic. Do not add salt. That will toughen the lentils. Bring to a rolling boil and then reduce the heat to medium. Cover and cook for 1 to 1.5 hours, stirring intermittently and adding warm water whenever needed. The lentils must be submerged in water at all times. It is done when all the lentils are soft and mushy. By the end of the cooking process, the garlic is mushy and it disintegrates into the stew. Cooking the garlic with the lentils, mellows the sharpness of the garlic and makes the lentils incredibly flavorful. 3. In a large wok or skillet add 1 tablespoon of oil and teaspoon of ghee (clarified butter). Heat it over medium high heat. 4. Add the cumin seeds and lower the heat to medium. 5. Once the cumin has stopped spluttering, add the Hing/Asafoetida and the finely minced ginger add fry till its slightly golden. 6. The chopped tomatoes goes in next. Cook till the tomatoes are slightly mushy. 7. Now add the garlic infused lentil-mix along with the cooking water. Season the stew with salt. Crank up the heat so that the lentils-mix comes to a boil. 8. Once it comes to a boil lower the heat and let it simmer for 5 minutes. If needed, add more water. The resultant dish can be thick or soupy according to preference. So add your water accordingly. Also, add the whole (or slit) green chilies and a small bunch of chopped cilantro/coriander leaves, while the stew simmers. 9. Serve warm. It is best eaten with steamed rice or soft rotis. Or if you are a bit of a soup-o-holic like me, you might prefer a more thinner consistency and enjoy with crackers or crusty bread. Notes: If you are new to Asafoetida powder, also known as Hing, it is a crucial ingredient in Indian vegetarian cooking. A dried and powdered resin from a tree, asafoetida has a unique smell and flavor. It is called for often in Indian cooking, primarily with legumes and vegetables. While on its own, the smell may strike you as overpowering and somewhat unpleasant, in cooking it mellows out and produces a flavor similar to onion and garlic. I recently found a very well written article that introduces asafoetida to the western world. An interesting read. You can find it here. All kinds of Dals or Lentils provides us with slow absorbing carbohydrates, protein and dietary fibers. The micro-nutrients like vitamins and other mineral vary with each type of Dal/Lentils. 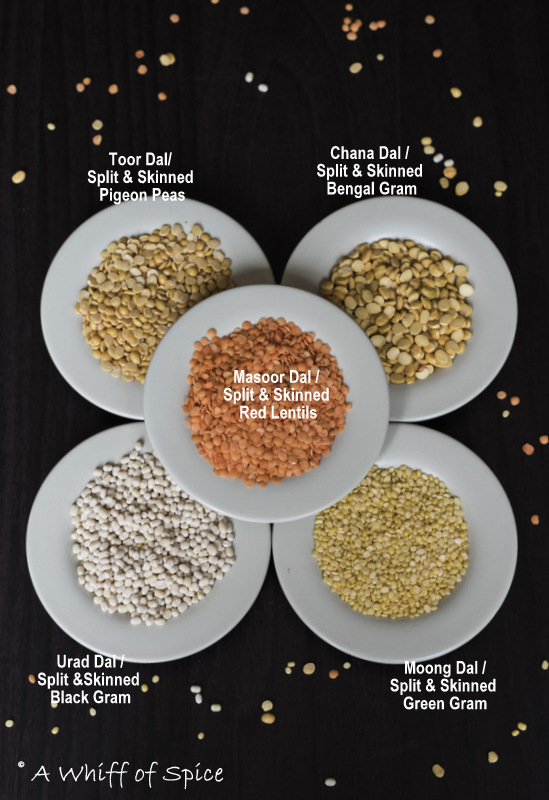 When we combine all 5 variety of Dal/Lentils in one recipe, we are maximizing the health benefits of each variety of dal and getting all the nutrients together. Toor or Arhar Dal/ Split and Skinned Pigeon Peas: Apart from protein and fiber, it contains folic acid which helps prevent anemia and is also important for pregnant women as it is essential for fetal development and can help prevent neural tube birth defects. It is low in calories so is good for people who are on weight loss diets. It also helps control blood sugar levels. Moong Dal/Split and Skinned Green Gram: Moong dal is a dieter-friendly dal rich in iron and potassium. Iron helps maintain hemoglobin levels and potassium helps reduce blood pressure. It is extremely light and easy to digest. Chana Dal/ Split and Skinned Bengal Gram: Chana dal is rich in B-vitamins which help energize you. It is full of fiber which helps diabetics to control their blood sugar levels. It also has potassium and folic acid. The fibre in it helps lower cholesterol levels preventing heart problems. Masoor Dal/ Split and Skinned Red Lentils: Masoor dal helps reduce blood sugar levels especially controlling the blood sugar spikes after a meal, controls hypertension, prevents anemia and lowers cholesterol. 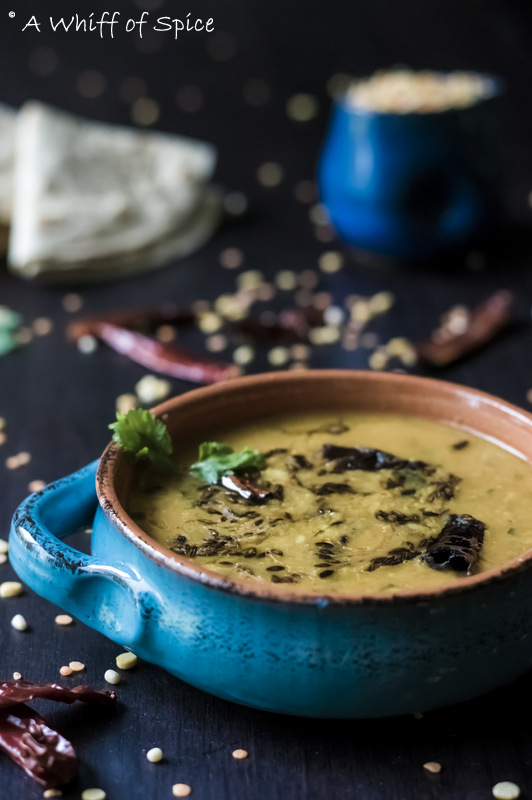 Urad Dal/ Split and Skinned Black Gram: Urad dal is rich in iron, folate, fiber, potassium. It is also a good source of calcium. It also boosts your energy and keeps you active.